That’s something that surprised me when I first came! Colombia is really big! Well, maybe not as big as China, or Brazil, but it’s as big as France, Spain and Portugal combined! 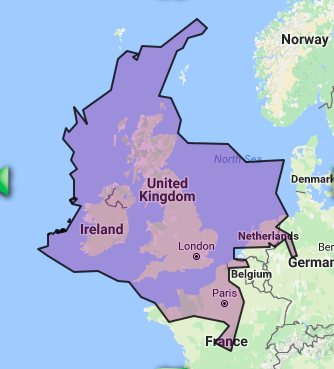 It’s more than 4 times than the UK! So, Colombia is BIG, with lots to SEE!! I guess I shouldn’t complain about how hard it is to travel across the country, how long it takes to drive, with traffic. Well, no wonder, not only are roads few to come by, the distances are also long! From Bogota to Cartagena takes 1.5 hours! From Bogota to Leticia (the city of the Colombian Amazon area) is 2 hours! People often ask me if they should take the bus to the coffee region like Manizales or Armenia. Well, actually, it’s a no brainer, when the bus takes 10 hours and the flight takes less than an hour. Unless you can sleep on buses. It’s worth taking the flight!